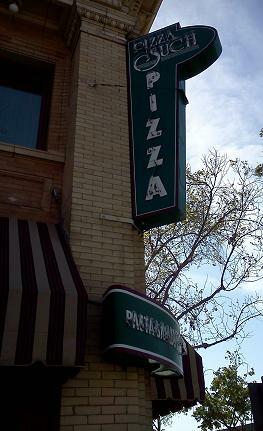 Not to be confused with Pizza ‘N Stuff in La Verne, its closest cousin by punctuation, Pizza n’ Such has been a Claremont fixture since 1979, family owned and operated. A college and family favorite, the restaurant occupies a prominent corner downtown in a former bank, later a pharmacy, built in in 1912 — 100 years ago this year! — across from Starbucks and the Village Grille. In a nice touch, the blade sign on the corner is an altered and restored version of the pharmacy sign that hung there for many years. The interior includes a wooden bar with beer and wine, green booths, dark wood, a high ceiling, original moldings and hanging lamps and fans. It’s classy but casual. 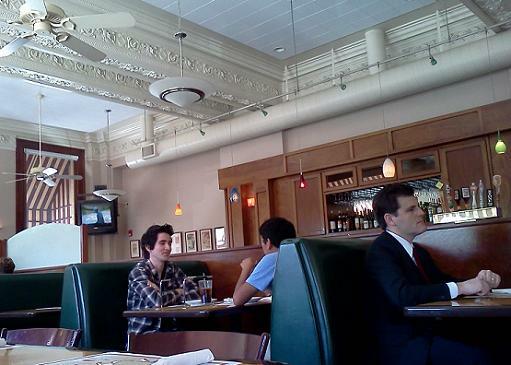 I end up there probably once a year and once had a birthday lunch there with a group. I went in recently for lunch because I had a birthday coupon for a free medium pizza as long as I ordered a starter. So I got the house salad ($4) and then a medium with spinach (usually $14). Pizza n’ Such, though, is a lot of people’s favorite, and if it’s not my first choice, and often I kind of overlook it, I’m always happy if a friend suggests meeting there: Oh, yeah, Pizza n’ Such. Service is friendly and generally provided by high school or college students. Besides pizzas, they have sub sandwiches, salads and pastas, and for dessert they have Dr. Bob’s ice cream, a local favorite. That’s the n’ Such. Friday’s column (read it here) is an essay about a professional milestone: my 25 years in newspapers, an anniversary that comes on Sunday. As I indicate therein, I’m hoping to write a followup on a few matters I didn’t have space for today: “the changes I’ve seen, the characters I’ve worked with, the reasons we do what we do.” That’s what came to mind on deadline. If anyone has other or better questions or areas for me to address there, or here, feel free to ask. 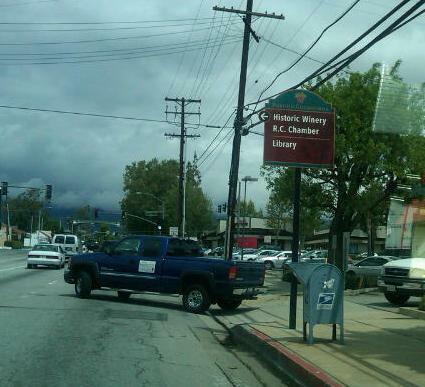 I like Rancho Cucamonga’s directional signs to local sites of importance, but watch the arrows! This one, below Foothill on Archibald, facing motorists driving north, should be pointing up, as in “drive straight,” to get to the library and the winery. Confusing matters further, reader Bob Terry, who took the photo, said the Chamber of Commerce is now on Arrow Highway, i.e., south of this sign rather than ahead or to the left. Interestingly, a second directional sign on Archibald a few blocks south also had an arrow pointing in the wrong direction before it was corrected. Wednesday’s column (read it here) is about Record Store Day, a Saturday event whose local epicenter is Rhino Records in Claremont. 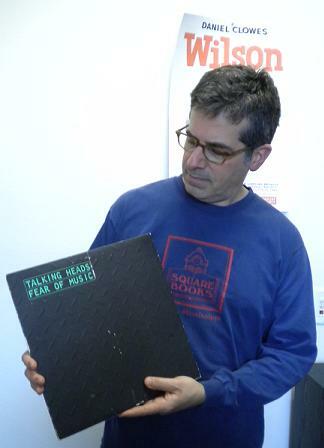 But it’s also about a Thursday event at the store, a reading by Jonathan Lethem from his just-published book, an entry in the 33 1/3 series, about the Talking Heads album “Fear of Music.” Here he is with a copy of the album. Not his own copy, btw; I borrowed it from the personal collection of Rhino’s general manager to use for the photo. Secrets behind the photos! * Entertainment Weekly just posted a Q&A with Lethem about the book that goes into far more depth; for fans of his or of the album, the link is here. 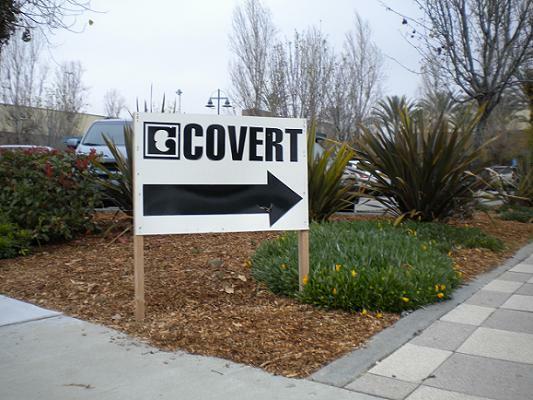 This super-secret business seems to be hiding in plain sight. I’d like to say I shot the photo using a miniature camera hidden in my tie, but that wouldn’t be true. Seen at Sixth and Mountain, Ontario. 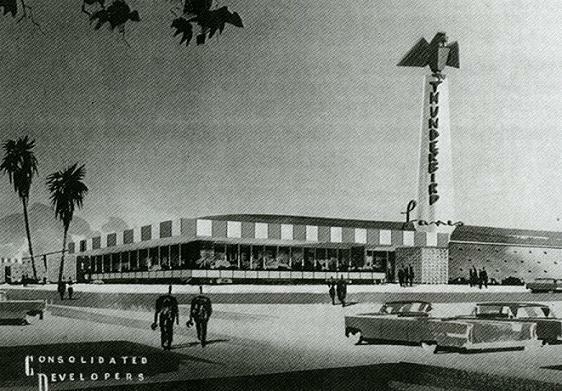 Thunderbird Lanes, 1555 N. Mountain Ave., was a bowling alley just below the 10 Freeway in Ontario that operated from 1960 until about 1991. It was torn down in 1996 to make way for the Edwards 14 multiplex. 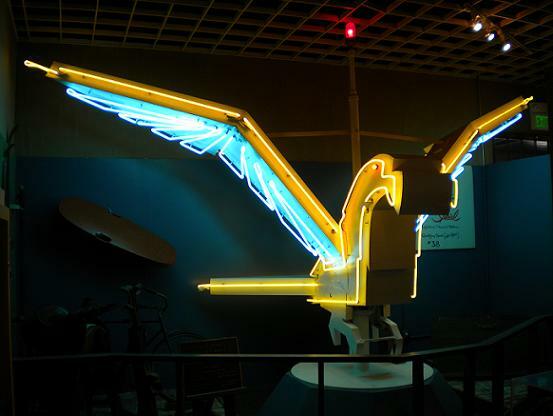 A vertical pole sign spelled out the name Thunderbird and was crowned by a neon-edged bird, wings extended. 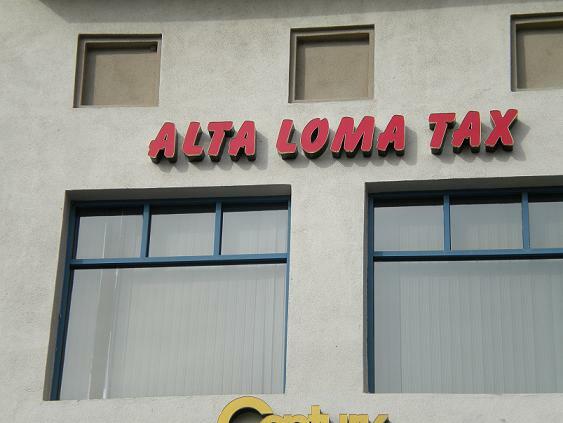 I never bowled there, arriving after the center closed, but I remember the sign being just tall enough that from the freeway the bird could be seen peeking above the barrier. At the Ontario Library’s Model Colony History Room, I paged through some phone books for information. 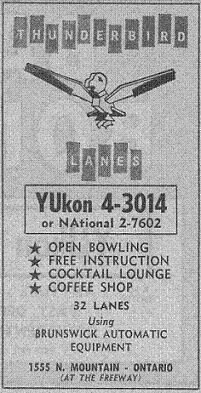 The nifty 1960 ad at right notes that the Thunderbird, 1555 N. Mountain Ave., had 32 lanes and “free instruction.” The 1968 ad boasts that the Thunderbird had a “Daytime Housewives’ Leagues” (!) and was open 24 hours (!!). Definitely a good era for bowlers. By the 1980 ad, the only portion still open 24/7 was the Thunderbird’s coffee shop, named the Trucker’s Spot. Makes me wonder if passing truckers had been among the night-owl bowling crowd. Anyway, as I said, the bowling alley was demolished, but the Thunderbird figure atop the sign was saved, repaired and placed in the city’s Museum of History and Art. That’s the bird below. The museum, at 225 S. Lemon Ave. (essentially, the southeast corner of Holt and Euclid), is definitely worth a visit. The two photos above were contributed by reader David Sutherland, who took them circa 1986. 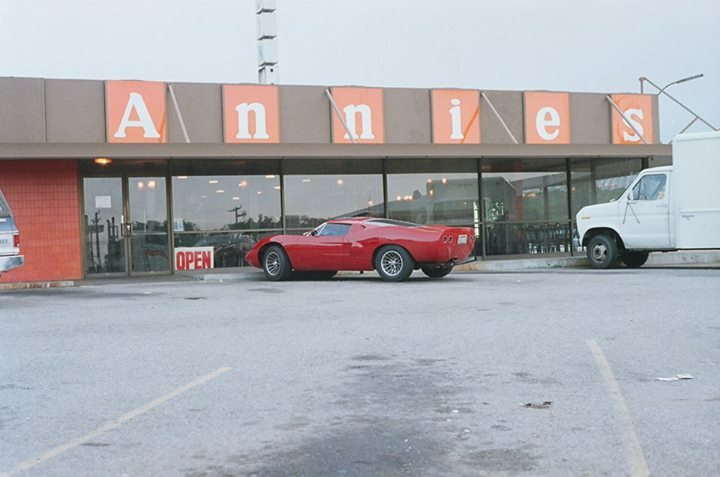 Annie’s was the coffee shop name at that point. You’re encouraged to leave a comment if you have a memory of the Thunderbird, or even if you just think the bird is cool. Adam Pringle, left, and Mark Michaels team up on “Great Balls of Fire” shortly after noon Thursday in Claremont. 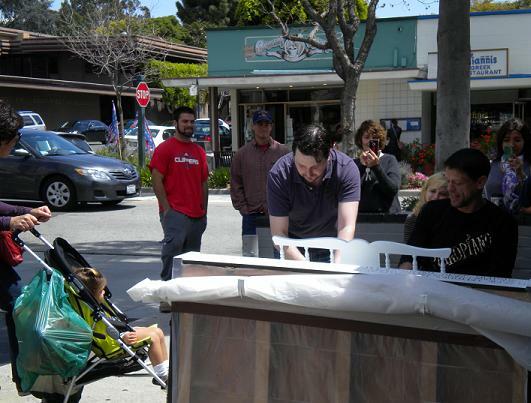 Sunday’s column (read it here) begins with an item about the “Play Me, I’m Yours” art project in Los Angeles County, which has installed an upright piano outside Rhino Records in downtown Claremont for anyone to play. The project’s website lists the sites of the 29 other pianos and has photos and videos, including from Claremont. 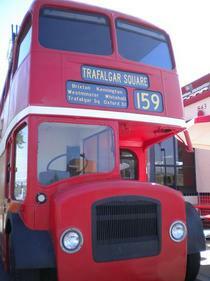 What you notice right away at London Burger is the red double-decker bus parked in front. The owners bought the London bus secondhand, restored it, took out the engine and put it outside their restaurant as a conversation piece. 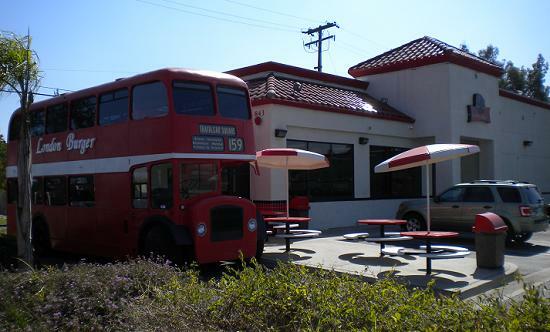 The fast-food restaurant, which opened in April 2012, occupies a former Spike’s Teriyaki Bowl on an uninspiring portion of Mountain Avenue between a mortuary and a Taco Bell, with a McDonald’s across the street, making the red bus more of a surprise. I suspect a lot of people will think the restaurant is named London Broil. I bought lunch the other day before introducing myself to the owners and asking what the deal is with the bus. They have burgers, a veggie burger and fish and chips. I got a London Cheeseburger ($4.03), steak fries ($1.39) and medium soda ($1.69). There’s nothing especially London about the burger — thankfully they don’t pile mushy peas on it — but the result was ambitious for a place with a drive-thru. You can get a burger as a slider, a 4-oz. (as I did) or a 7-oz., and on a flour or wheat bun. The beef is mixed in the kitchen and handformed into patties rather than being premade frozen discs, a depressingly common practice. 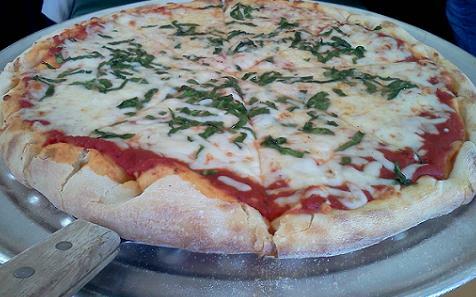 The cheese is mozzarella, although you can substitute American. The fries were acceptable but a little soft. I’m told the fish and chips is beer-battered cod. The interior decor is standard fast-food except for the British touches: a red London phone box as a centerpiece, faux stone accents like a castle, British photos (many with doubledecker buses), two tabletop 3-D dioramas of London and a red and black color scheme to match the bus. The bus, a 1961 model, is intended to open for dining soon — what a concept — once they finish converting the interior into booths and install air conditioning. So, it’s a novelty, but the food’s not bad at all. Good show, London Burger. 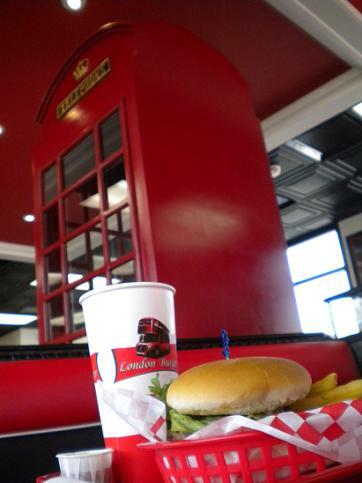 Friday’s column (read it here) is about London Burger, a new Ontario restaurant with a British theme inside and a double-decker bus outside. Anglophiles can click on the thumbnail photo at right for a larger view.